Shortly after Disneyland opened in 1955, they realized that Mickey and Minnie weren’t the only mice inhabiting the park. The rodent population, and presumably also the food that is dropped on the ground, attracted colonies of feral cats. Rather than trying to get rid of them, Disneyland officials decided to put them to work controlling the mouse population. Today, there are plenty of benefits to being a Disney-employed mouser. When they’re not prowling the grounds, these corporate fat cats spend their days lounging at one of the park’s five permanent feeding stations. Of course, Disney also goes to great lengths to manage its feline population. Wranglers at the park work to spay and neuter adult cats, and any time kittens are found, they’re put up for adoption. It has been estimated that there are around 200 cats in the park. They mostly come out at night, after the crowds have gone home. 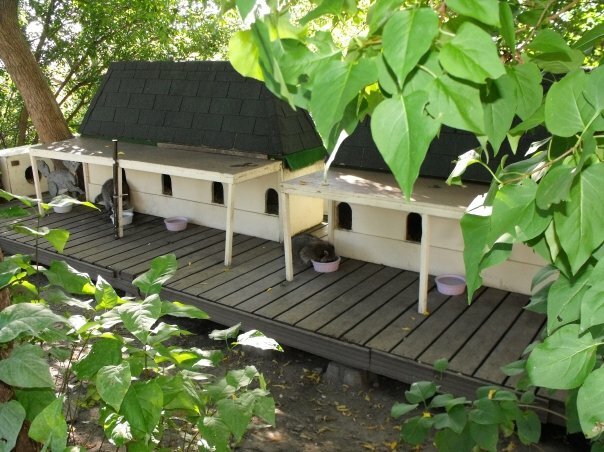 The cats are viewed as “partners”, according to Gina Mayberry, who oversees the Circle D Ranch area, where the cats are housed. She calls the cats “natural exterminators,” as they keep the park’s rodent population in check. It has only been in the last few years (7 years, according to one source) that Disneyland has adopted a Trap-Neuter-Release program. The cats are trapped and neutered, plus given a wellness checkup, and then released back into the park. The program has also been quite successful at finding adoptive homes for any kittens that are born to the feral cats. As in a regular TNR program, after the cats have been neutered and returned to the colony, they are provided shelter, care, and food at five feeding stations throughout the park. The feeding stations are pretty well hidden, to keep the interaction with park guests at a minimum. The cats come and go as they wish, but are not often spotted by guests. A few have been seen roaming around in the plants and fenced-off areas in the landscaping of Frontierland, near the Hungry Bear, and from the upper decks of the Mark Twain. They’ve also been seen on one of the mini-mountains near Grizzly River Rapids by a youngster who thought he had seen a mountain lion! It’s nice to know that a big corporation like Disney will take the time and effort needed to care for their feral cats. Next time you visit the park, be sure to be on the lookout for the cats of Disneyland. Would expect nothing less from Disney! like this page so cute cats ……………………. No, I didn’t know that! Appreciate it, though! There are many pictures of the cats, but missing background stuff such as their feeding and care. I was wondering what the feeding station looked like, thanks for the info and picture since it’s hidden from the public for pictures.